I mentioned before about the fun we've been working on for our boys' birthdays this year, and it's probably going to take me a couple of posts to share everything related to the party. It all began last year when my oldest was reading through the book series for maybe the third time. He LOVES the books, and we love how he'll laugh out loud as he reads them even though he's read them over and over. Somewhere along the way we were talking about the story, and he mentioned that he wished you really COULD get a Hogwarts letter when you turn eleven. I tucked that away in the back of my mind, and it became the seed for this whole project. I think I just really wanted to prove to him that it really CAN happen! I wanted to make sure Jonathan could get his Hogwarts letter for his birthday, but I thought it might be a let-down if it was just a piece of paper. 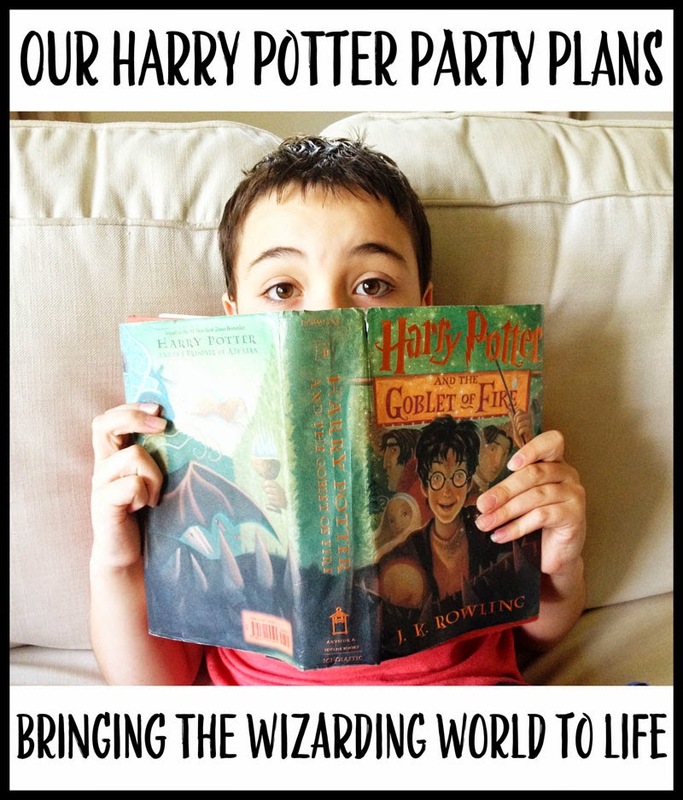 It would have to be an invitation to the only place where you can go to Hogwarts--The Wizarding World! The more Justin and I thought about it, we knew that our kids are really at the perfect age to go to Disney World, too, so that became the plan. By the first of the year, we had decided that Jonathan would receive his Hogwarts acceptance letter for his birthday inviting him and his brother to Hogwarts and to visit Disney and the rest of Universal while they are there. In the end, we decided December would be the best time for us to take a trip of this magnitude, so I was afraid that the letter would still be a bit of a let-down. That's when the party idea was born, and it evolved from there. We don't typically do big friend birthday parties, choosing instead to focus on quality family time. We've actually only had one "party" for them, and it was five years ago. That's when we decided that the five-year birthday party plan would work to our advantage. I'm really excited for these post! Not only am I personally a HP fan, I am also creating a Halloween themed party. Look forward to reading more! Could you tell me where to get the Platform 9 3/4 Quarters Printable Tickets? Hi Becca! There is a list of links for all of the HP posts at the end of this one. You'll find the invitation ticket printables in the first link in that list. I hope that helps!